How Long Does It Take to Publish an Academic Book? Part of my elation came from reflecting on just how long I had been working on the project. I thought it might be interesting for younger scholars to get a full perspective, so I am writing out a brief timeline of book-related events here. It might also give a better overview on the origins, thought process, and evolution of a long-form project. There is also going to be a healthy dose of luck. And regardless of utility to others, it’s going to be cathartic for me. 9/25/2009: Yes, we are starting almost ten years ago. I was in my gap year between undergrad and grad school. Applications were not yet due, but I was set on getting into a program and making international relations research into a career. Iran must comply with U.N. Security Council resolutions and make clear it is willing to meet its responsibilities as a member of the community of nations. We have offered Iran a clear path toward greater international integration if it lives up to its obligations, and that offer stands. But the Iranian government must now demonstrate through deeds its peaceful intentions or be held accountable to international standards and international law. I remember watching Obama make that speech (which YouTube has preserved for posterity) and thinking that such a bargain would not work. Everything I had read at that point about credibility and commitment problems would suggest so. Why wouldn’t Iran simply take the short-term concessions and continue building a weapon anyway? No paper had constructed that exact expectation yet, and so I thought it would be a straightforward project. Nevertheless, it would have to go on the backburner. I still needed to revise my existing writing sample and do grad applications. 4/2010: By this point, I had accepted an offer from the University of Rochester. I started fiddling around with modeling Obama’s deal and came to an interesting conclusion. It seemed that compliance was not only reasonable, it was rather easy to obtain. All the proposing country had to do was give concessions commensurate with what the potential proliferator would receive if it had nuclear weapons. The potential proliferator could not profit by breaking the agreement, as doing so would barely change what it was receiving but would cost all of the investment in proliferation. Meanwhile, as long as the potential proliferator could keep threatening to build weapons in the future, the proposer would not have incentive to cut the concessions either. This project was a lot more interesting than I thought it would be! I can make out some of what I was trying to do there. It is ugly. But I also think this is useful advice for new students. As a first year grad, you are in a very low stakes environment. Trying to do something and doing it poorly still gets you a foothold for later. In any case, active progress on this was slow for the next couple of years. I had to take some classes to actually figure out what I was doing. 3/9/2012: I watched the previous night’s episode of The Daily Show for no real reason. In a remarkable stroke of luck, it featured an interview with Trita Parsi, an expert on U.S.-Iranian relations. He made some off-the-cuff remarks about Iran’s concerns of future U.S. preventive action. Fleshing out the logic further gave me the basis of Chapter 6 of my book, with an application to the Soviet Union. 9/2012: I made “The Invisible Fist” my second year paper. At the time, this was the biggest barrier for Rochester graduate students, but the idea from three years earlier got me through it. The major criticism as I circulated the paper was that the model only explained why states should reach an agreement. And while nonproliferation agreements are fairly commonplace, so too are instances of countries developing nuclear weapons. Trying to simultaneously demonstrate that (1) agreements are credible and (2) other bargaining frictions might make states fail to reach a deal anyway was too much for a single article. I began looking for more explanations for bargaining failure beyond the one I had encountered for the Soviet Union. 5/17/2013: My dissertation committee felt that I had found enough other explanations, as I passed my prospectus defense. This was the first time I produced an outline that (more or less) matches what the book would ultimately look like. 12/2014: International Interactions R&R’d an article version of Chapter 6. It would later be published there. Tangible progress! 5/2015: Reading through the quantitative empirics of my book, Brad Smith suggested a better way to estimate nuclear proficiency. This eventually became our 𝜈-CLEAR paper. I would later replace the other measures of nuclear proficiency in the book with 𝜈. 6/10/2015: After two years of grinding through lots of math and writing, I defended my dissertation. Hooray, I became a doctor! 7/14/2015: The Joint Comprehensive Plan of Action—a.k.a. the Iran Deal—is announced. This was could not have been timed any better. Chapter 7 of my book was a theory without a case, only a roundabout discussion of the Iraq War. But the JCPOA nailed everything that the chapter’s theory predicted. I began revising that chapter. 8/2015: I began a postdoc at Stanford. My intention was to use the year to get the dissertation into a book manuscript and talk to publishers. But after six years of thinking about nuclear negotiations and not much else, I was really burned out. I still received excellent feedback on the project during the postdoc, but I set aside almost all of it. The year was productive for me overall, just not on the one dimension I had intended. 10/2015: The JCPOA went into effect. With nuclear negotiations all over the news, I hit the job market at exactly the right time. 7/2016: I moved to Pittsburgh. Remember that Obama speech in front of the G20? In what is a remarkable coincidence that bookends my journey, that summit was just a couple of miles away from where my office is now. 1/2017: I was still burned out. This became a moment of reflection, where I realized that 20 months had passed without making any progress on the manuscript. I convinced myself that if I didn’t get moving, the thing would hang over my head forever and not provide me any value toward a tenure case. So I cracked down and got to work. 3/2017: I sent an email to an editor at Cambridge. He quickly replied, and we set up a meeting at MPSA. Once in Chicago, he liked my pitch and asked to see a draft when I was ready. 5/22/2017: After making some final changes to the manuscript, I sent off a proposal, the introductory chapter, and the main theory chapter to Cambridge. 6/6/2017: My editor wrote back asking for the full manuscript to look over. I did so the next day. One day later, I saw an email notification on my phone that he had responded. I panicked—there is no way that a one-day response could be good news, right? But it was! You may notice a theme developing here: my editor was fast. 9/6/2017: After three months, the reviewers come back with an R&R. Hooray! Having published a few articles beforehand, the R&R process was not new to me. But it is an order of magnitude more complicated for book manuscripts. Article reviews are rarely more than a couple of pages. In contrast, I had twelve pages of comments to wade through for the book. This was daunting: a mountain of work and a lengthy road before any of it actually makes noticeable progress to any outside observer. After having gone through almost two years of burn out on the project, this had me slightly worried. I dedicated at least a couple of hours every day to working on the book. Whenever I finished an item, I would go to the whiteboard and knock the number down by one. This gave me some tangible sense of progress even when the work ahead still seemed enormous. It also kept me focused on this project and resist the temptation to work on lower-priority projects that I could finish sooner. 11/28/2017: I sent the revised manuscript back. 1/28/2018: The remaining referee cleared the book. All the hard steps were over! 3/28/2019: I held the real thing in my hand for the first time. So almost ten years later, I am all done with the project. I cannot describe how satisfying it was to move the book’s computer documents out of the active folder and into the archived folder. I can now finally put all of my effort into the other projects that have been pushed to the sidelines. But with all of that said, ten years feels like a bargain. Some of that time was pure circumstances: I had to actually learn how to be a political scientist for a good portion of it. I was also an okay writer at the beginning of this, but now I feel that I have a much better grasp of how to communicate ideas. Nevertheless, some portion of it was my own fault. I could have not put the project on the back burner for more than a year. I suppose if that was the price I had to pay to maintain my own sanity and happiness (and not work on something I was not into at the time), it was a deal well-worth taking. I was also really, really fortunate with the review process. The first editor I spoke to was receptive of the project, and the reviewers I pulled liked it. Had that not been the case, it is easy to see how a ten year project could have turned into a twelve or thirteen year project. While I hope that future book projects will not last as long, I doubt this part will be as simple the next time around. In any case, it feels great to finally be done! Losing the Popular Vote Doesn’t Make Trump Illegitimate. It’s Irrelevant. As more returns come in from California, it looks like Trump is going to lose the popular vote despite having secured a majority of electoral votes. In the coming days, if the 2000 election was any indication, I suspect we will see Democrats arguing that this somehow makes Clinton the “rightful” president and that Trump wouldn’t be president if we had a “more sensible” electoral system. These arguments are silly: the popular vote tells us virtually nothing about what an election would have looked like if the popular vote mattered. The basic idea is that elections are strategic; campaigns adopt particular tactics given the rules of the game. Consequently, we cannot judge whether Clinton would have won in a popular vote contest given the results of an electoral vote contest. Here’s an analogy to make the idea more concrete. Baseball games are decided by runs. Teams strategize accordingly, sometimes sacrificing outs to get a man across the plate. This occasionally results in games where the winner gets fewer hits than the loser. If you change the rules of the game, you change the strategic incentives. Award wins based on hits, and suddenly those sacrifice strategies would never happen. As such, we can’t retroactively award wins based on hits for games where the teams were strategizing for runs. Similarly, if only the popular vote mattered, campaign incentives change. Candidates choose which policies they support based on the pivotal voter in the election. With an electoral vote, this is the median of the median voters of each state. With a popular vote, this is simply the median voter of the country. Individual level incentives change as well. With an electoral vote, people in California have fewer incentives to go to the polls than someone in Pennsylvania; the result in California is a foregone conclusion, whereas the result in Pennsylvania is in doubt and could sway the electoral college. With a popular vote, each individual’s incentives are identical. Thus, we don’t know how the election would have turned out under a different electoral system. Given the high concentrations of Latinos in otherwise uncompetitive states (California, Texas), it’s extremely unlikely that Trump would been as ardent in his anti-immigration policy if the popular vote mattered. And that alone means that we can’t use Tuesday’s returns to judge how a popular vote would have played out. Bottom line: Trump won with the system we are playing with, and that’s all that matters. Does Increasing the Costs of Conflict Decrease the Probability of War? Thus, in theory, the reason that increasing the costs of conflict decreases the probability of war is because it makes the set of mutually preferable alternatives larger. In turn, it should be easier to identify one such settlement. Even if no one is being strategic, if you randomly throw a dart on the line, additional costs makes you more likely to hit the range. Nevertheless, history often yields international crises that run counter to this logic like trade ties before World War I. Intuition based on some formalization is not the same as solving for equilibrium strategies and taking comparative statics. Further, while it is true that increasing the costs of conflict decrease the probability of war for most mechanisms, this is not a universal law. Such is the topic of a new working paper by Iris Malone and myself. In it, we show that when one state is uncertain about its opponent’s resolve, increasing the costs of war can also increase the probability of war. The intuition comes from the risk-return tradeoff. If I do not know what your bottom line is, I can take one of two approaches to negotiations. First, I can make a small offer that only an unresolved type will accept. This works great for me when you are an unresolved type because I capture a large share of the stakes. But if also backfires against a resolved type—they fight, leading to inefficient costs of war. Second, I can make a large offer that all types will accept. The benefit here is that I assuredly avoid paying the costs of war. The downside is that I am essentially leaving money on the table for the unresolved type. Many factors determine which is the superior option—the relative likelihoods of each type, my risk propensity, and my costs of war, for example. But one under-appreciated determinant is the relative difference between the resolved type’s reservation value (the minimum it is willing to accept) and the unresolved type’s. Consider the left side of the above figure. Here, the difference between the reservation values of the resolved and unresolved types is fairly small. Thus, if I make the risky offer that only the unresolved type is willing to accept (the underlined x), I’m only stealing slightly more if I made the safe offer that both types are willing to accept (the bar x). Gambling is not particularly attractive in this case, since I am risking my own costs of war to attempt to take a only a tiny additional amount of the pie. Now consider the right side of the figure. Here, the difference in types is much greater. Thus, gambling looks comparatively more attractive this time around. But note that increasing the military/opportunity costs of war has this precise effect of increasing the gap in the types’ reservation values. This is because unresolved types—by definition—view incremental increases to the military/opportunity costs of war as larger than the resolved type. As a result, increasing the costs of conflict can increase the probability of war. What’s going on here? The core of the problem is that inflating costs simultaneously exacerbates the information problem that the proposer faces. This is because the proposer faces no uncertainty whatsoever when the types have identical reservation values. But increasing costs simultaneously increases the bandwidth of the proposer’s uncertainty. Thus, while increasing costs ought to have a pacifying effect, the countervailing increased uncertainty can sometimes predominate. The good news for proponents of economic interdependence theory and mutually assured destruction is that this is only a short-term effect. In the long term, the probability of war eventually goes down. This is because sufficiently high costs of war makes each type willing to accept an offer of 0, at which point the proposer will offer an amount that both types assuredly accept. 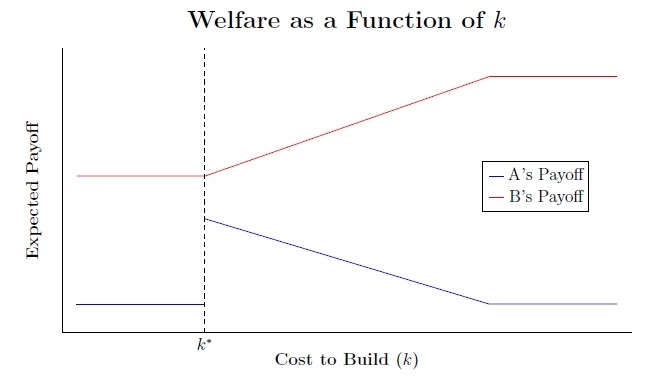 The above figure illustrates this non-monotonic effect, with the x-axis representing the relative influence of the new costs of war as compared to the old. Note that this has important implications for both economic interdependence and nuclear weapons research. Just because two groups are trading with each other at record levels (say, on the eve of World War I) does not mean that the probability of war will go down. In fact, the parameters for which war occurs with positive probability may increase if the new costs are sufficiently low compared to the already existing costs. Meanwhile, the figure also shows that nuclear weapons might not have a pacifying effect in the short-run. While the potential damage of 1000 nuclear weapons may push the effect into the guaranteed peace region on the right, the short-run effect of a handful of nuclear weapons might increase the circumstances under which war occurs. This is particularly concerning when thinking about a country like North Korea, which only has a handful of nuclear weapons currently. As a further caveat, the increased costs only cause more war when the ratio between the receiver’s new costs and the proposer’s costs is sufficiently great compared to that same ratio of the old costs. This is because if the proposer faces massively increased costs compared to its baseline risk-return tradeoff, it is less likely to pursue the risky option even if there is a larger difference between the two types’ reservation values. Fortunately, this caveat gives a nice comparative static to work with. In the paper, we investigate relations between India and China from 1949 up through the start of the 1962 Sino-Indian War. Interestingly, we show that military tensions boiled over just as trade technologies were increasing their costs for fighting; cooler heads prevailed once again in the 1980s and beyond as potential trade grew to unprecedented levels. Uncertainty over resolve played a big role here, with Indian leadership (falsely) believing that China would back down rather than risk disrupting their trade relationship. We further identify that the critical ratio discussed above held—that is, the lost trade—evenly impacted the two countries, while the status quo costs of war were much smaller for China due to their massive (10:1 in personnel alone!) military advantage. Again, you can view the paper here. Please send me an email if you have some comments! Abstract. International relations bargaining theory predicts that increasing the costs of war makes conflict less likely, but some crises emerge after the potential costs of conflict have increased. Why? We show that a non-monotonic relationship exists between the costs of conflict and the probability of war when there is uncertainty about resolve. Under these conditions, increasing the costs of an uninformed party’s opponent has a second-order effect of exacerbating informational asymmetries. We derive precise conditions under which fighting can occur more frequently and empirically showcase the model’s implications through a case study of Sino-Indian relations from 1949 to 2007. As the model predicts, we show that the 1962 Sino-Indian war occurred after a major trade agreement went into effect because uncertainty over Chinese resolve led India to issue aggressive screening offers over a border dispute and gamble on the risk of conflict. Shifting power is often cited as an explanation for war. But the causal mechanism isn’t so straightforward. While the concept of preventive war dates back to Thucydides’ and The History of the Peloponnesian War, the modern understanding is just barely in its third decade. In Rationalist Explanations for War, James Fearon conclusively shows that bargained settlements exist that leave both parties better off than had they fought. The puzzle of war is why wars occur despite this inefficiency. One of Fearon’s answers is that power may shift over time. Although a rising state and a declining state may reach an efficient bargain in the future, the declining state may be better off securing a costly but advantageous outcome through war today. As much as the rising state might protest, it cannot credibly commit to maintaining the status quo distribution of benefits. Rather, it will eventually want to exploit its new found power by shifting the benefits in its favor. This idea has taken off in international relations literature. It is now the textbook explanation of preventive war. (See Frieden, Lake, and Schultz, Kydd, or myself.) It also has obvious empirical implications—growing power implies more war—which many quantitative scholars have explored. (See Bell and Johnson, Schub, and Fuhrmann and Kreps for recent examples.) The literature is growing, and knowledge is accumulating. These are great things to see. Unfortunately, the causal mechanism behind preventive war isn’t entirely clear, and the notion that power shifts alone cause war is a bit of a myth. One hidden assumption in the simple preventive war construction is that power growth is exogenous. That is, the rising state does not choose whether to grow or how. It simply does, as though power grows on trees. Yet, in practice, most power shifts are endogenous. Raising an army, building new aircraft carriers, investing in missile defense, and designing nuclear weapons all require active decisions by the state. The basic model ignores this part of the process and instead jumps to the strategic tradeoffs once the state has decided how to shift power. Thus, a natural question to ask is how endogenous power shifts impact the probability of war. Thomas Chadefaux addresses this in his aptly-titled Bargaining over Power article. Perhaps surprisingly, the war result reverses completely—in any instance that a preventive war would have been fought, bargaining over power leads to a peaceful outcome. The intuition is straightforward once you work through the mathematical logic. A rising state really wants to avoid war today because fighting would take place on terms most disadvantageous to it. Thus, if it had to choose between undertaking a power shift that would induce preventive war and a smaller power shift that the declining state would acquiesce to, it would choose the latter. After all, a smaller (but realized) power shift is preferable to a costly war. Of course, Chadefaux’s results only take us further down the rabbit hole. There is ample historical evidence to tell us that states fight wars to forestall shifts in power. What then actually causes preventive war? The literature provides a variety of answers, which I will now attempt to synthesize. First, some power shifts may actually be exogenous. If demographic trends are at the root of a power shift, countries may be unable to effectively limit their future power. In civil conflicts, protesters may be unable resolve coordination problems in the near future, leading to dramatic shifts in power over a short period of time. This helps explain why autocratic regimes exert such great effort in controlling their citizens’ movements. Fearon recognized that the commitment problem disappears when states can bargain over power. But when the object of value also confers military advantages, bargaining can break down when there are indivisibilities in the good. Chadefaux also showed that having distinct discount factors can lead to conflict even without those indivisibilities. Implementing such an agreement may create other bargaining problems, too. Debs and Monteiro investigate a model with costly power shifts that declining states cannot effectively monitor. Declining states sometimes need to initiate wars so as to deter weapons construction they might not otherwise observe. My research looks to see whether offering concessions-for-weapons can resolve these issues. Fortunately, the answer is yes. However, in the book manuscript I am working on, such deals fail when there is uncertainty over the declining state’s willingness to intervene. Undoubtedly, there are many more answers to why states fight preventive wars even when power shifts are endogenous. Sadly, though, this literature feels somewhat stifled given that new research often constructs models with exogenous power shifts without any justification for why states cannot negotiate over power. I conclude by discussing some implications of endogenous power shifts. First, quantitative scholars should care greatly about bargaining over power. Although we have established connections between power shifts and war, the above theory indicates that the causal relationship is not obvious. For example, it might be that other bargaining problems cause to both power shifts and war. We need to think carefully about these higher-order issues and search for empirical evidence of them. Policy-wise, this tells us a great deal about negotiations with Iran. If Tehran constructs a nuclear weapon, it must be doing so because it does not anticipate preventive war. Thus, one way the United States can hold Iran to its commitments under the Joint Comprehensive Plan of Action is to maintain a credible threat to fight a war should Tehran violate the agreement. Internalizing the threat, Iran would not build a weapon. This is perhaps the ideal for Washington—the American threat to invade does all the heavy lifting, allowing the United States to obtain its best policy outcome without actually paying the costs of war.